The Prevalent Medical Conditions web page provides resources and tools to support the implementation of the Policy/Program Memorandum (PPM) No. 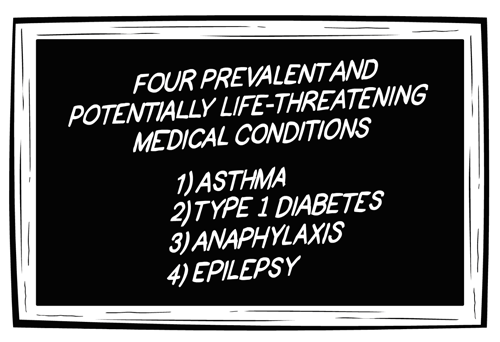 161: Supporting Children and Students with Prevalent Medical Conditions (Anaphylaxis, Asthma, Diabetes, and/or Epilepsy) in Schools. The final policy was released on February 28, 2018, for implementation by September 2018. What’s on this web page? Click on the medical conditions below to find and download resources sorted by medical condition, including sample Plan of Care templates, fact sheets, videos and discussion guides. These resources are intended to support the development and implementation of school board policies for students with prevalent medical conditions in schools, including training needs. Additional resources will be posted as they become available. Resources on this web page were developed by the Ontario Education Services Corporation, Ophea, Canadian Paediatric Society, Diabetes Canada, Lung Association - Ontario, Asthma Canada, Food Allergy Canada, and Epilepsy Ontario. Note: Links to third party content are for general informational purposes only and do not constitute a recommendation or an endorsement. Free online courses about food allergy and anaphylaxis for school, child care, and community settings.